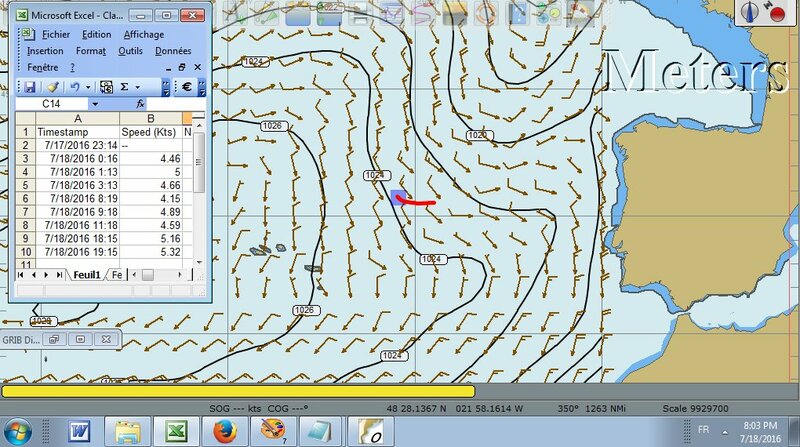 We are crawling at 4 knots and sometimes 40* off course to Oporto. It is not impossible that we arrive Friday evening. 19. Juli 2016 15:17:40 MESZ (mid euro summer time) Wow, we have now caught the North breeze we had expected, magnificent cooler weather, running under asymmetric spinnaker, the boat serenely and smoothly gliding at 9 knots whilst we all do bricolage jobs, simply idyllic. 19. Juli 2016 06:19:48 MESZ (mid euro summer time) No wind , under engine. At least 400 miles to go. Forecast shows very little wind till tomorrow and we don't have enough diesel to motor 24 hours. This means that we might arrive only on Friday. Desole mais nous avons ete tres occupes par beaucoup de bricolages, nettoyages etc et j'ai un peu oublie de donner des nouvelles. Tout va tres bien avec Mario et Keith. Nous sommes dans le temps et attendons le vent demain. Je m'occuperai d'informatique un peu plus tard, il reste Bcp à faire pour que l'électronique fonctionne. Changer la girouette en premier, le pilot contrôler etc. Je t'appellerai dès que je serai à Porto. Sorry we have been very busy with work on the boat, cleaning, etc Everything is fine with Mario and Keith. We are on schedule and expecting wind tomorrow. I'll be looking at computer stuff later, there is much to be done for the electronics to work properly. Change the wind indicator, the autopilot, etc I will call when we arrive in Porto. 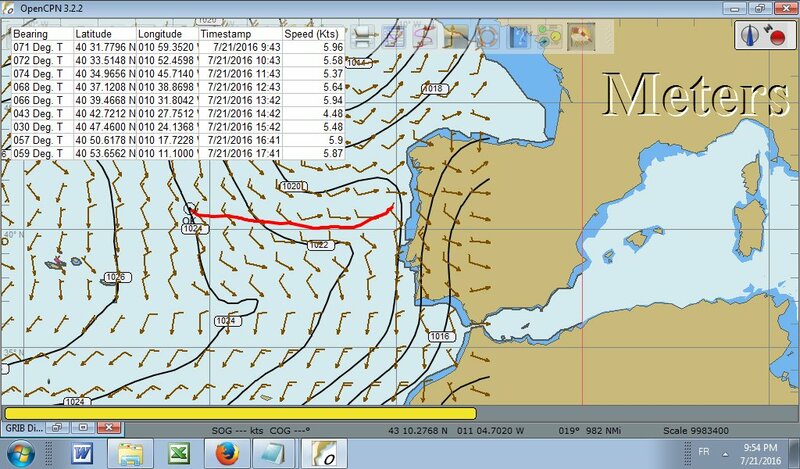 Moderate S to SE breeze so far, boat sails incredibly well, and we are doing around 200 miles per day, arriving Oporto probably Thursday morning. Now, Sunday midday we are crossing a front and wind should back to North for the rest of the crossing. Good weather, no rain, and often cloudless. Vent modere S SO , le bateau navigue tres bien et nous faisons 200 miles par jour environ, arrivée probable Porto jeudi matin. Maintenant dimanche midi, nous traversons un front et les vents doivent tourner au nord pour le reste de la traversee. Bonne meteo, pas de pluie et souvent sans nuages.